Staff at housing and care organisation The Guinness Partnership have been working hard to raise awareness of dementia across the organisation and encourage staff to take action to help people affected by dementia. 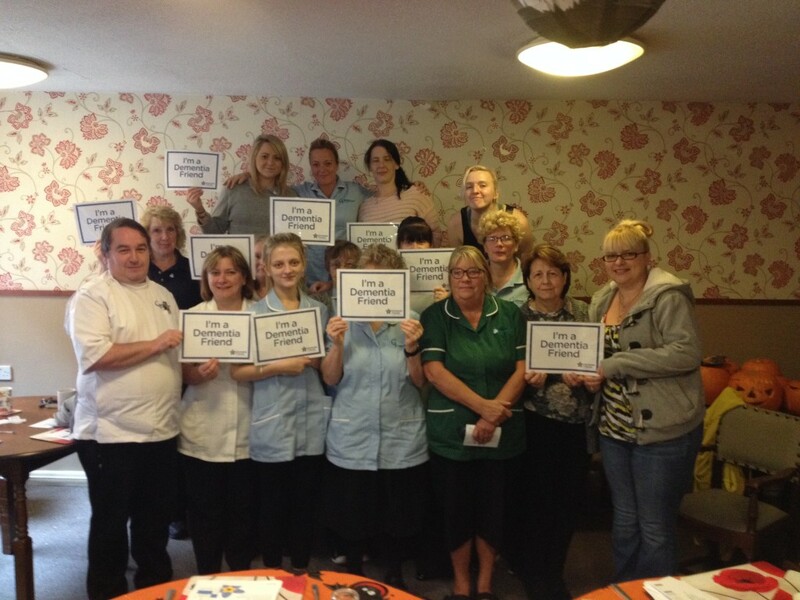 We spoke to Wendy Wells to find out what impact Dementia Friends has had. Why is it important that the organisation support people affected by dementia? We know that there are likely to be more than 1,000 older people with dementia living in our homes or receiving our care services. We want to help our customers live well and keep their independence for as long as possible. So we’re taking practical steps to become a dementia-friendly organisation. We understand everyone with dementia is individual and therefore we are looking to tailor our services to give them an individual service and also take this into account when building new homes and updating our current ones. We know that it is possible to live well with dementia and absolutely committed to helping our customers do this whilst giving them amazing service at the same time. How has the Dementia Friends initiative helped you to support people affected by dementia? One of the biggest challenges we faced when starting the project was raising awareness across Guinness of what dementia is and how people are affected by it. We wanted everyone to have a real understanding of why it’s important to work towards becoming dementia friendly and how they can make small changes within their day to day roles that will make a big difference. Dementia Friends ticked the box with what we wanted our workforce to understand about dementia and has been so helpful in leaving a lasting impression. How have the Info Sessions been received within the organisation? Any memorable moments from the Sessions? Or great actions that people have pledged at the end of the Sessions? There has been fantastic feedback from all of the Sessions we have carried out. We have 10 Dementia Friends Champions running Sessions and they’ve created over 700 Dementia Friends so far. Every session has an impact and I am always emailed by at least one person after thanking me for arranging it and telling me how much they really enjoyed it and now look at things a little differently. What changes have been made at the organisation as a result of the Dementia Friends initiative? Staff across Guinness are already thinking differently, I have had customers and families put in contact with me that need support in some way. This has been picked up following a normal day to day interaction with a member of staff working out in the community. Something may have occurred or been said, that before the staff member wouldn’t have thought was relevant to us or our place to get involved in, but now understands how important it is to be aware of our customers with dementia. 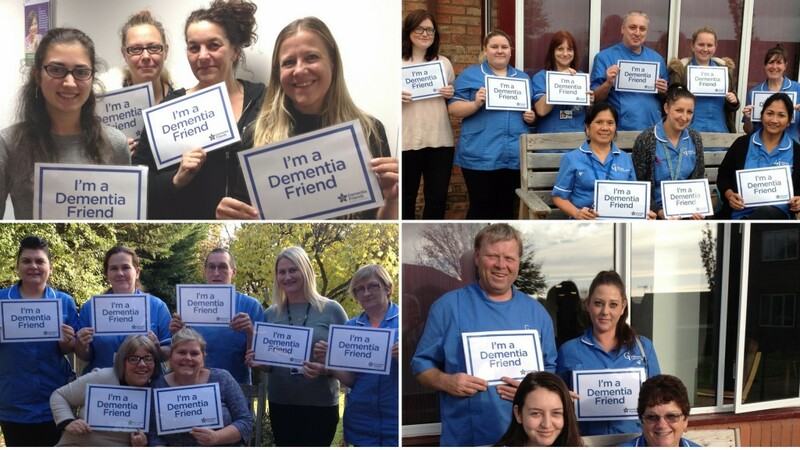 The contact centre are all Dementia Friends and so every telephone interaction going forward should now leave our customers with a feeling that they have been listened to, assisted and have not been a hindrance in any way – no matter how many times they have contacted us. Have there been any experiences or encounters with people affected by dementia within the organisation which have highlighted the need for increased understanding of dementia and its effects? Following the theme above, I have had to get involved in a case whereby a gentleman with late stage dementia was being perceived by his neighbours to be a perpetrator of anti-social behaviour within his block. He used to wander late at night, shout loudly within his flat and throw rubbish over his balcony. We worked with the local authority to get the gentleman the support he required, removed his bedroom mirror – which was the cause of the shouting within the flat – and also worked with the neighbours to raise awareness around challenging behaviours and were very clear that we would support him not look to sanction him. This entry was posted in Becoming More Dementia Friendly, Champions Corner, Dementia Friend Sessions, Dementia Friends News and tagged Alzheimers, Dementia, Dementia Freinds, Dementia Friends Champion, the guinness partnership on February 21, 2017 by Dementia Friends.